​​What will success look like? 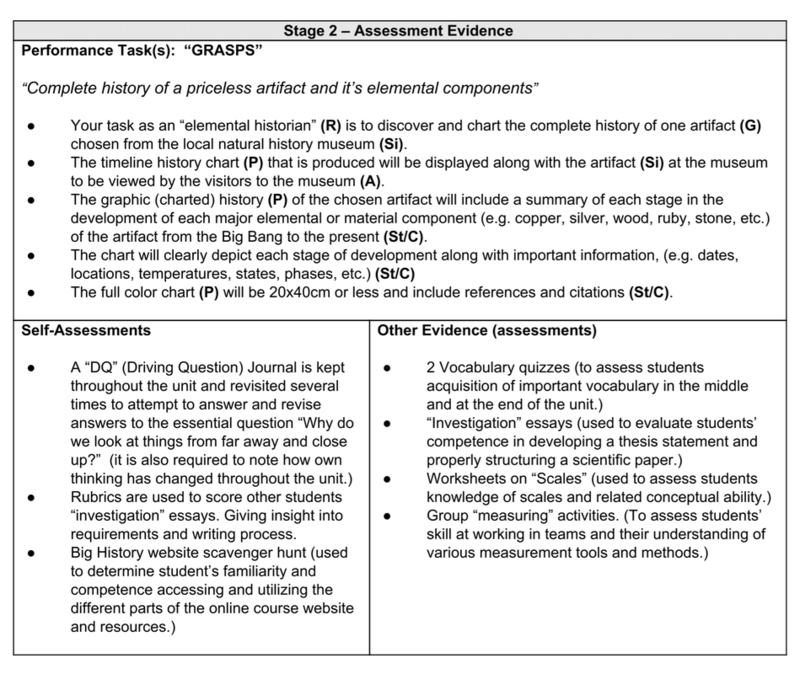 "Getting evidence of understanding means crafting assessments to evoke transferability: finding out if students can take their learning and use it wisely, flexibly, creatively"
With the desired learning outcomes in mind, the second stage of Backward Design requires us to determine acceptable evidence of students having developed the sought after understandings. Without sufficient evidence, there is no way to know whether learning has taken place. Therefore, assessment takes a central role in the design process since; if performance tasks are developed which require the knowledge, skills, and understandings that comprise the unit goals, then those tasks can also be used to determine what scaffolding will be needed to accomplish them. This will lead us naturally to the lesson activities and materials that will be utilized in Stage Three. There are many methods of gathering evidence of meeting content and performance standards. While standardized testing has its place in modern education (see the note on standardized tests below), Stage Two of the Backward Design plan is focused on what's known as "Alternative Assessment"; often called "authentic, comprehensive, or performance assessments" (Edutopia Staff, 2013), these assessments are "usually designed by the teacher to gauge students' understanding of material. Examples of these measurements are open-ended questions, written compositions, oral presentations, projects, experiments, and portfolios of student work. Alternative assessments are designed so that the content of the assessment matches the content of the instructions." Effective assessments should embody aspects of complexity, relevance and application, collaboration and original creation; as well as align with the standards of rigor and relevance as presented by the International Center for Leadership in Education. Authentic assessment is further explained with a plethora of resources given by Jon Mueller (2016) in his Authentic Assessment ToolBox. Education (ICLE) to examine curriculum, instruction, and assessment. The Rigor/Relevance Framework is based on two dimensions of higher standards and student achievement." (ICLE 2014). The framework can aid in developing performance tasks to ensure that high level knowledge assimilation and application are being assessed. The full completed example Lesson Plan Template for The Big History Project can be found on the Forum page. What kinds of evidence do we need to find hallmarks of our goals including that of understanding? What specific characteristics in student responses, products, or performances should we examine to determine the extent to which the desired results were achieved? Does the proposed evidence enable us to infer a student's knowledge, skill, or understandings? Click Here for examples of types of assessments that align with the "Six Facets of Understanding" as discussed in Stage One. 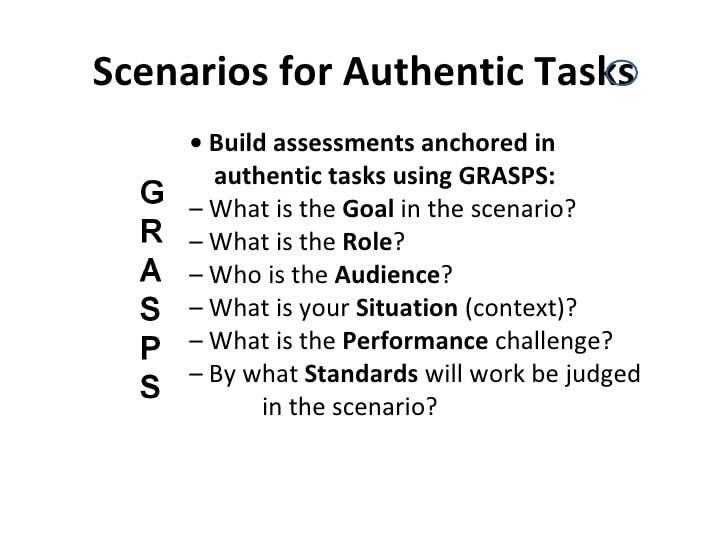 After watching the video below, see how the GRASPS model is applied in the example performance task for the "Big History Project" plan above. A variety of formative assessment should be used consistently throughout the unit and course to ensure that students are meeting critical benchmarks and staying on target to be able to successfully complete the performance task(s). These can take the form of questions, quizzes, journals, self-assessment rubrics, entry/exit tickets, etc. Whatever the methods used, there should be routine opportunities for assessing the student's progress and giving them feedback to aid in their learning journey. Given the goals, what performance evidence shows that they have been met? Given the essential questions, what evidence would show that the learner had deeply considered them? Given the understandings, what would show that the learner comprehends it? 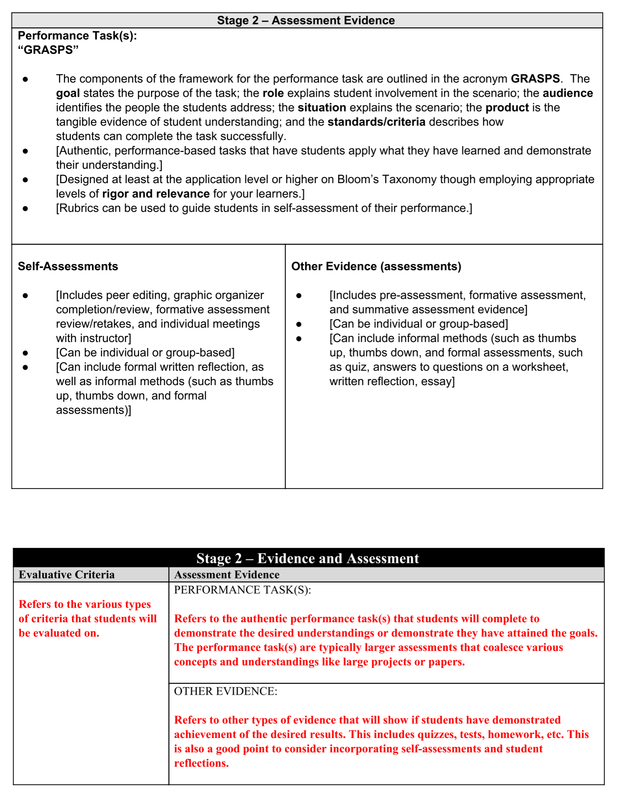 An important key to manage evaluation of student work in a consistent and fair manner, especially when it comes to the complex nature of authentic performance tasks, is the use of rubrics; criterion-based scoring guides consisting of a fixed measurement scale and descriptions for each score point. Click Here for more detail about rubrics and their many forms and uses. Mr. Wiggins explains in his article "Defining Assessment" (2002) that testing, to him, is “a small part of assessment… an audit, a snapshot”, with an important role in showing the specific knowledge of individual students. He says that the results of a test should be compared with other more practical, realistic skills-based assessments that are often collaborative and project based to get a more complete picture of each student’s learning. Oftentimes, educators may be bound to certain tasks, projects, or tests as required components of their curricula. As noted in the quote above, It's not necessary to start at Stage One in the Backward Design process. However, if we are to teach for understanding, we must bring our goals, assessments, and instruction into alignment with one another. Continue to Stage Three for information about Planning Learning Experiences and Instruction.